Adoption Fundraising: can it be affordable? Adoption Fundraising – Can it be affordable? It is possible to make your adoption affordable. Nightlight will partner with you to explore all options, and help make it happen. Some Nightlight clients have fully funded their adoption through no-interest loans, grants, tax credits, and fundraising! 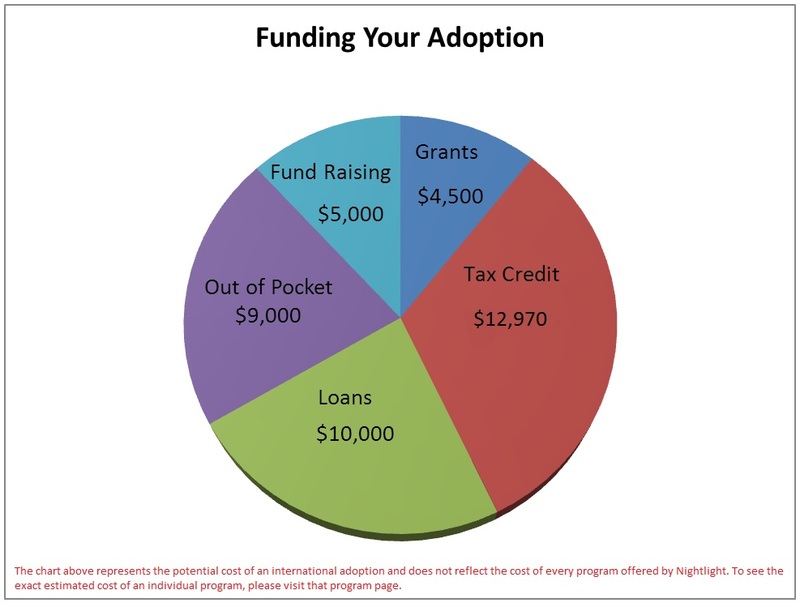 Below is an example of how a typical couple could fund an adoption from Russia, which could cost about $42,000, but may only require $9,000 out of pocket expenses. Click on the links below to learn more about each source of funding. Keep in mind that adoptions from foster care are generally free, or minimal cost. In fact, families who provide foster care or who adopt from foster care are eligible for a monthly stipend from the state, free medical care, and other subsidies. AdoptionBridge is a website where you can tell your adoption story, post pictures, videos, and keep people informed about what’s going on. You can accept donations from your friends and family, and these funds are sent to Nightlight (or your adoption agency). Set up a page for your adoption, and then send the link to all your friends, church members, family, etc. This need-based fund supports the adoption of hard to place or special needs children through domestic adoption or international adoption. Our scholarship committee reviews applications and awards available money to prospective adopting families.